(Nanowerk News) Researchers at Rensselaer Polytechnic Institute have developed a new, ultra-simple method for making layers of gold that measure only billionths of a meter thick. The process, which requires no sophisticated equipment and works on nearly any surface including silicon wafers, could have important implications for nanoelectronics and semiconductor manufacturing. Sang-Kee Eah, assistant professor in the Department of Physics, Applied Physics, and Astronomy at Rensselaer, and graduate student Matthew N. Martin infused liquid toluene — a common industrial solvent – with gold nanoparticles. The nanoparticles form a flat, closely packed layer of gold on the surface of the liquid where it meets air. By putting a droplet of this gold-infused liquid on a surface, and waiting for the toluene to evaporate, the researchers were able to successfully coat many different surfaces – including a 3-inch silicon wafer — with a monolayer of gold nanoparticles. 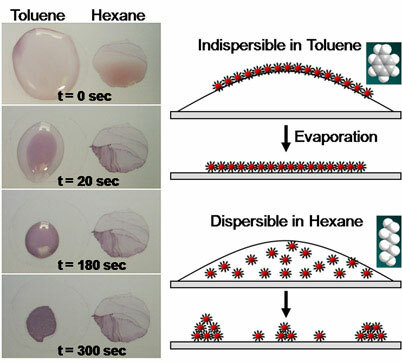 Drops of gold-infused toluene applied to a surface evaporate within a few minutes and leave behind a uniform layer of nanoscale gold. The process requires no sophisticated equipment, works on nearly any surface, takes only 10 minutes, and could have important implications for nanoelectronics and semiconductor manufacturing. "There has been tremendous progress in recent years in the chemical syntheses of colloidal nanoparticles. However, fabricating a monolayer film of nanoparticles that is spatially uniform at all length scales — from nanometers to millimeters — still proves to be quite a challenge," Eah said. "We hope our new ultra-simple method for creating monolayers will inspire the imagination of other scientists and engineers for ever-widening applications of gold nanoparticles." Results of the study, titled "Charged gold nanoparticles in non-polar solvents: 10-min synthesis and 2-D self-assembly," were published recently in the journal Langmuir ("Charged Gold Nanoparticles in Non-Polar Solvents: 10-min Synthesis and 2D Self-Assembly"). Co-authors on the paper are former Rensselaer undergraduate researchers James I. Basham '07, who is now a graduate student at Pennsylvania State University, and Paul Chando '09, who will begin graduate study in the fall at the City College of New York. The research project was supported by Rensselaer, the Rensselaer Summer Undergraduate Research Program, the National Science Foundation (NSF) Research Experiences for Undergraduates, and the NSF's East Asia and Pacific Summer Institutes and Japan Society for the Promotion of Science.